This is my kind of recipe Kitty! I love love love grilled shrimp, and I bet that it is amazing with chipotle caramelized pineapple~pinning to try asap! Chipotle and pineapple... sounds like a winner of a combination Kitty! Isn't chipotle perfect for grilling! Thanks for the tip about freezing the chipotles! I'll be doing that with my leftovers! Those look good. I think eating kabobs is just plain fun! Yum! More food on a stick! Those look delicious Kitty. I would enjoy one right now. I love shrimp and fresh pineapple too. Kitty, this makes me want to go fire up the grill, but it's 1 AM. Think I'll put this on the menu soon. Kabobs are one of my favorite summer foods. Thanks for sharing the recipe. You had me at "shrimp"!! I know the secret ingredient, but I cheated!! Love the little gnome tucked into your plant - so cute!! That looks delicious! Just leave the belly burner stuff off mine, LOL! 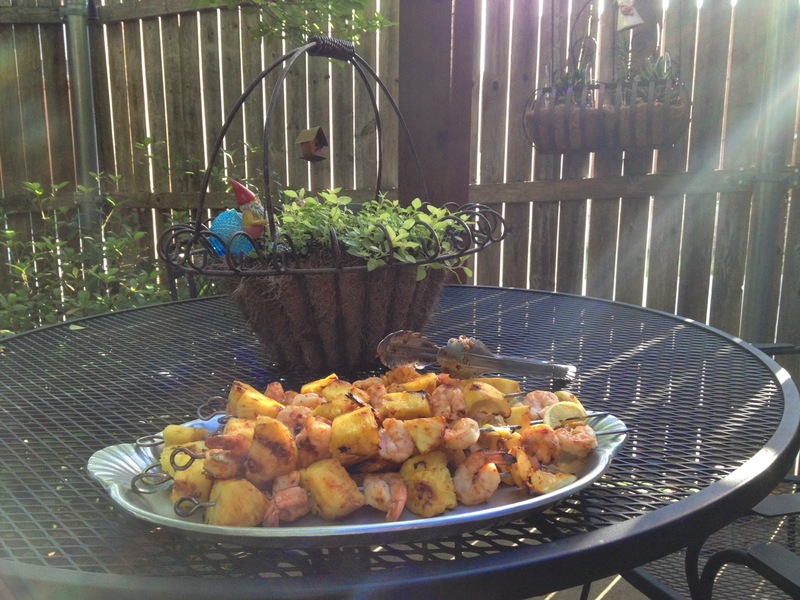 I love grilled pineapple, and shrimp, wow! Yum, yum, yum! Did I mention yum?! Sounds and looks so good and you know what, I'm not even a fan of shrimp, but you have me wanting some right now! I made beef skewers a couple of weeks ago and used wooden skewers - that was awful! I will never do that again and will get some metal ones :) Love and hugs to you! Thanks for that great tip about freezing the chipotles on waxed paper before freezing them. Pineapple and shrimp are a delicious combination, especially when spiced up a little bit. This looks delicious, Kitty. I forgot to say, I put my remaining chipotle in a blender, and then make a log, like a cookie log in plastic, then I put it in a small labeled lidded jar so it does not get lost or a UFO (Unidentified Frozen Object). You can just slice off what you want. That whole plate looks so mouth watering!! We need to try that one. (Do you know that you are one of my two major sources of pinned recipes that I want to try? I must just really love your cooking style. looks amazing and love the flavors! Altho I'm not a shrimp (or fish) fan, this does sound good. Oooh . . . this looks delicious! My family will love this, and it's perfect for summer. Thanks for sharing Kitty! Yum, yum, yum! I love shrimp and these sound delish Kitty. Have you noticed that I love just about everything? lol! Can't wait to put some on the barbey! Thanks for sharing with SYC.